As we hit spring, SelfMadeHero’s phenomenal array of new title releases show no signs of slowing pace. Their most recent release is a prime example of what they do best, compelling storytelling and beautiful visuals in equal measure. 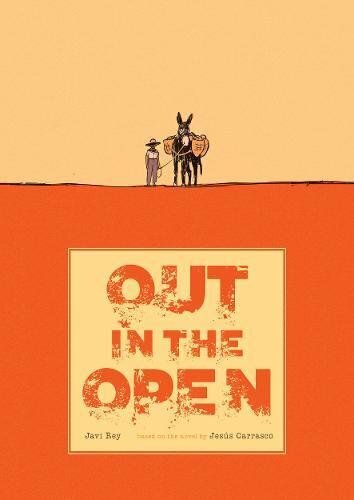 Out in the Open by Jesus Carrasco and illustrated by Javi Rey is an epic tale of a young boy escaping his life through a hot, savage landscape which has been utterly devastated by drought. As he seeks shelter and an escape from his pursuers, amidst finding himself without food or water a mammoth journey lies before him. This journey is aided from encountering an old goatherder who offers the child help amidst the chaos – and amidst the terror which constantly runs through the boy’s mind. This graphic novel is an adaptation of Carrasco’s award winning novel which was published in over 20 countries and won multiple awards. But unlike his book, amidst the panelled pages of SelfMadeHero’s adaptation a whole new dimension to Carrasco’s incredible story takes shape. In this adaptation, Carrasco’s brilliant storytelling truly brings you into the midst of the action. His mysterious pursuers pose a terrifying threat to the young boy which keep you guessing as to what will happen next. Truly you’re kept on the edge of the seat as you follow him through a relentlessly dark and savage landscape. There’s a multitude of questionable morals mixed in with Carrasco’s story which undoubtedly are key to why the story works so well. What is most impressive is the elegant, elaborate and descriptive writing by Carrasco amidst such a dark tale. Though the plight of the child is cruel, you’re constantly waiting to see what might lie just over the horizon… could it be true salvation? Admittedly the dialogue itself is kept short and to the point. But in doing so Carrasco allows for the absolutely beautiful visuals by Javi Rey to truly speak for themselves. Rey’s illustration seem to exude the heat and dust of the harsh landscape with an overarching tone of deep, earthy magentas.You might also recognise his work within the comic industry, not to mention the fact he’s the author of Adelante. If ever there was an artist who could do this story justice then undoubtedly Rey is that man. Striding Forth with Osprey’s Skarab and Skimmer Backpacks! Astounding Adapters with Anker’s 7-in-1 Premium USB C Hub Adapter! Prepare To Be Shaken And Stirred As Secret Cinema Announce Further Tickets For It’s Sold Out Casino Royale Shows!